First published in August, 2012. This family, which is still extant in the noble houses of Jersey and Clarendon, deduced its descent from Villiers, Seigneurs de L'Isle Adam, in Normandy, France; and the first of its members who came into England was amongst the companions in arms of WILLIAM THE CONQUEROR. 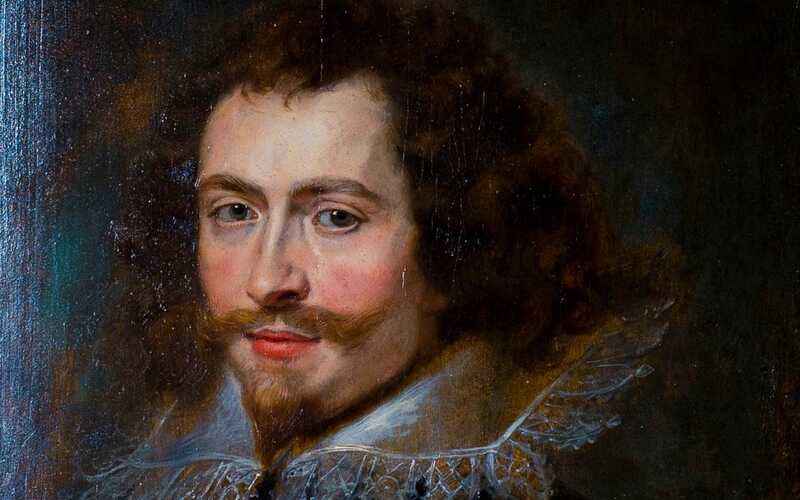 GEORGE VILLIERS (1592-1628), born at Brooksby, received the first rudiments of his education at Billesdon School in Leicestershire, whence being removed at the age of 13, by his mother, he was sent to France, and there soon attained "perfection in all polite accomplishments". Upon his return home, he went first to London as a suitor to Sir Roger Ashton's daughter, one of the Gentlemen of the Bedchamber and Master of the Robes to JAMES I, but was dissuaded from the connection by another courtier, Sir John Graham, one of the Gentleman of the Privy Chamber, who encouraged him to "woo fortune in the court". Soon after this he attracted the attention of the King, and succeeded the favourite Robert Carr, 1st Earl of Somerset, as cup-bearer to His Majesty (being, said Sir William Dugdale, of stature tall and comely, his comportment graceful, and of a most sweet disposition). From this period he rose rapidly in estimation, and the Queen, through the influence of George Abbot, Archbishop of Canterbury, an enemy of Somerset's, being induced also to protect him, his fortune was at once established. The first honour he received was that of Knighthood, which was conferred in Her Majesty's bedchamber with the Prince's rapier: he was then sworn a Gentleman of the Bedchamber (1615), with an annual pension of £1,000 (£237,000 in today's money) payable out of the Court of Wards. The ensuing January he succeeded Edward, 4th Earl of Worcester, as Master of the Horse; and several months later was installed a Knight of the Garter. Before the end of the year (1616) he was elevated to the peerage as Baron Whaddon, Buckinghamshire, the ceremony of creation being performed at Woodstock; and he was very soon after advanced to a viscountcy, as Viscount Villiers. In 1617 his lordship was created Earl of Buckingham, with a special remainder, default of male issue, to his brothers John and Christopher, and their male issue. His lordship was further advanced, in 1618, to the dignity of a marquessate, as Marquess of Buckingham. This last dignity was succeeded by his appointment to the great office of Lord High Admiral, and his being sworn of the Privy Council; and about this time his lordship was constituted Chief Justice in Eyre; Master of the Court of King's Bench; High Steward of Westminster Abbey; Constable of Windsor Castle; and Chancellor of Cambridge University. In 1623, Lord Buckingham was sent into Spain with Charles, Prince of Wales, to accelerate the marriage then in contemplation between His Royal Highness and a Spanish princess. The journey, a most exceptional one, commenced on the 18th February, when Prince Charles and Lord Buckingham, putting on false beards, assumed the names of Thomas and John Smith, their sole attendant being Sir Richard Graham, 1st Baronet, Master of the Horse. Post-riding to Canterbury, where they took fresh horses, they were stopped by the mayor, as suspicious persons, whereupon Lord Buckingham was constrained to take off his beard, and to satisfy the mayor by stating that he was going incognito to survey the fleet as Lord High Admiral. At Dover they found Prince Charles's private secretary, Sir Francis Cottington, and Mr Endymion Porter, who had provided a vessel for their use: on which they embarked, and landing at Boulogne, proceeded to Paris, and thence travelled through France to Madrid. During their sojourn in Paris, Lord Buckingham is said to have fallen in love with Anne of Austria (Queen of France, consort of LOUIS XIII). It is certainly the case that, upon his return, Cardinal Richelieu refused him permission to land in a French port. At Madrid, Buckingham was involved in a dispute with the Count-Duke of Olivares, and received some affronts for his haughtiness, French garb, and great familiarity with Prince Charles. His royal master continuing, however, to lavish favours upon him, sent out letters patent, in 1623, creating him DUKE OF BUCKINGHAM. The Prince of Wales and the Duke of Buckingham, failing in the object of their journey, departed from Madrid on the 12th September, and arrived at Portsmouth in October, when His Grace was appointed Lord Warden of the Cinque Ports and Steward of the Manor of Hampton Court. The death of JAMES I followed about a year and a half later, but the influence of Buckingham was undiminished. His Grace officiated as Lord High Steward at the coronation of the new King; and was shortly afterwards sent as Ambassador Extraordinary to Holland, where he purchased a rare collection of Arabic manuscripts, procured in remote countries by the industry and diligence of Thomas Erpenius, a famous linguist. Those valuable documents were presented to Cambridge University, for which he intended them, after the 1st Duke's death. His Grace continued to bask in the same sunshine of royal favour, under CHARLES I, that he had so beneficially enjoyed in the last reign, but with the populace he had become an object of contempt. His influence was paramount, and to that influence was attributed all the grievances of the nation. The failure, too, of an expedition to Saint-Martin-de-Ré, for the relief of his Huguenot allies at La Rochelle, completed his unpopularity. To recover the ground he had lost by this untoward enterprise, His Grace projected another expedition, and had repaired to Portsmouth in order to forward its sailing. Here, while passing through a lobby, after breakfasting with Sir Thomas Fryer and other persons of distinction, he was stabbed in the heart by John Felton, an army officer. and died instantaneously. The 1st Duke's assassination occurred on the 23rd August, 1628, when His Grace had just turned 36 years of age. The Duchess was in the house, in an upper room, hardly out of bed; and the King and court at Sir Daniel Norton's, Southwick, Hampshire, merely six miles away. Following the 1st Duke's murder, Her Grace wedded secondly, Randal, 2nd Earl and 1st Marquess of Antrim, of Dunluce Castle, County Antrim. A lost masterpiece of the 1st Duke by Rubens was recently discovered. GEORGE, 2nd Duke (1628-87), KG, and in right of his mother, 20th Baron de Ros. This nobleman was very young at the time of his father's murder, and spent some years abroad after that event, travelling. He returned to England after the civil war, and had a command in the royal army at the battle of Worcester, 3rd September, 1651, from which unfortunate field, making his escape with difficulty, he reached London and was thence enabled to make good his retreat to Holland. At the restoration of the monarchy His Grace, with General Monck, rode uncovered before the King upon his public entry into London, and he was soon afterwards appointed a Knight of the Garter. The 2nd Duke formed one of the unpopular administrations of CHARLES II, which was designated the Cabal, from the initial letters of the ministers' names. "But towards the latter half of that monarch's reign", said the infamous genealogist and lawyer, Thomas Christopher Banks, "by his strange conduct and unsteady temper he sunk very low in the opinion of most people. He first seduced the wife of Francis Talbot, Earl of Shrewsbury, and then killed the Earl in a duel." "When this extraordinary man, with the figure and genius of Alcibiades, could equally charm the Presbyterian Fairfax, and the dissolute Charles; when he alike ridiculed the witty king and his solemn chancellor; when he plotted the ruin of his country with a cabal of bad ministers, or equally unprincipled, supported its cause with bad patriots; one laments that such parts should be devoid of every virtue. But when Alcibiades turns chemist, when he is a real bubble, and a visionary miser, when ambition is but a frolic, when the worst designs are for the foolishest ends, contempt extinguishes all reflections on his character." This nobleman, profligate as he was, held an elevated place amongst the great minds of his day, and as a wit was hardly equalled by any of his contemporaries. "He began life (said Banks) with all the advantages of fortune and person which a nobleman could covet; and afterwards, by favour of the King, had great opportunities of making himself as considerable as his father had been. But he miserably wasted his estate, forfeited his honour, damned his reputation, and, at the time of his death, is said to have wanted even the necessaries of life, and not to have had one friend in the world." Alexander Pope described him as more famous for his vices than his misfortunes; that having been possessed of £50,000 a year (in excess of £10 million today), and passed through many of the highest posts in the Kingdom, he died in 1687 at a remote inn in Yorkshire, reduced to the utmost misery. His Grace had married Mary, only daughter and heiress of Thomas, Lord Fairfax, the parliamentary general, and granddaughter maternally of Horatio, 1st Baron Vere of Tilsbury, but had no issue. He died in 1687, and his sister Mary, to whom the dukedom of Buckingham was in remainder, provided she had outlived the male descendants of her father, having predeceased him, all the honours which he had inherited from his father expired; while the barony of DE ROS, derived from his mother, fell into abeyance between the heirs-general of the sisters and heirs of George Manners, 7th Earl of Rutland. Former residences ~ Helmsley Castle, Yorkshire; Wallingford House, Admiralty, London; York House, Strand, London. 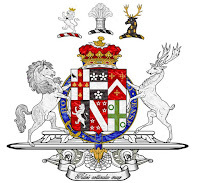 Buckingham arms courtesy of European Heraldry. Following a prompt from Google, I have amended the blog settings to enable a more mobile-friendly appearance on mobile phones. I hope those readers who tend to follow me on their smartphones will notice a difference. I’m grateful to Google for bringing this feature to my attention. The surname of ECCLES was assumed, it is said, by the proprietors of the lands and barony of Eccles, Dumfriesshire, as early as the period when surnames became hereditary in Scotland. JOHN ECCLES, of Kildonan, Ayrshire, living in 1618, married Janet Cathcart, of the Carleton family, and had two sons, John and Gilbert. 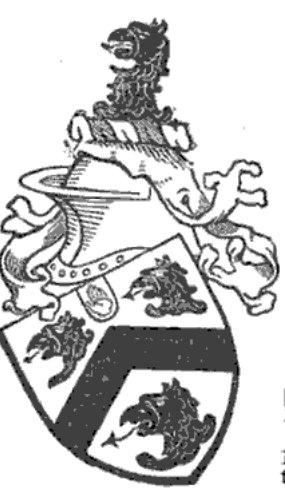 GILBERT ECCLES (1602-94), of Shannock, County Fermanagh, High Sheriff of County Fermanagh, 1665, and of Tyrone, 1673, settled in Ulster during the reign of CHARLES II, and acquired large estates in counties Tyrone and Fermanagh. Anne; Frances; Mary; Elizabeth; Margaret; Isabella. Charles (Rev), drowned at Bath, Somerset. Frances; Anna Rebecca; Mary; Elizabeth Letitia Sarah; Hester. Hester Catharine; Anna Jemima; Eliza Frances Wilhelmina. Annie Henrietta; Gertrude Marian; Constance Isabella. XENIA PENELOPE JOYNSON-WREFORD, born in 1935. ECCLESVILLE HOUSE, near Fintona, County Tyrone, was a plain, late-Georgian house, formerly the home of Raymond Saville Charles de Montmorency "Tibby" Lecky-Browne-Lecky, actor-musician and female impersonator. I'm seeking more photographs of Ecclesville prior to its demolition for the blog. Raymond Saville Conolly de Montmorency Lecky-Browne-Lecky, born in 1881, was the son of Conolly William Lecky-Browne-Lecky and Annie Henrietta Eccles. He died in 1961 aged 80, unmarried, having lived at Ecclesville. Ecclesville eventually became a nursing home. The house and its gate lodges were demolished about 1978. The McClintock of Seskinore website contains much information and illustrations of Ecclesville and the Eccles family. The Ecclesville demesne was acquired by the Eccles family ca 1668. The manor house was built in 1703, enlarged in 1795, and further extended in 1825 by John Dickson Eccles. 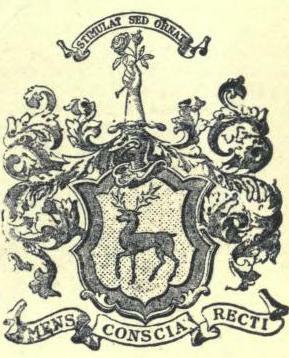 Fintona Golf Club forms a part of the former demesne; their logo contains the Eccles arms. Ecclesville Equestrian Centre was also part of the demesne. 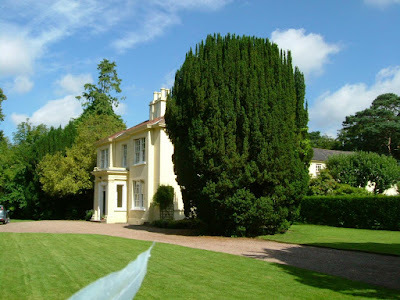 Photograph of Ecclesville House courtesy of McClintock of Seskinore website. First published in September, 2010. First published in July, 2012. This family, originally from Salford, Lancashire, settled in County Londonderry, 1690. JOHN CLARK, of Maghera, County Londonderry, married, about 1695, Jane White, of Belfast. Annie Penelope; Sarah Louise Jane; Jane Frances. Jane Dorothy Elizabeth; April Jillian; Sarah Primrose. 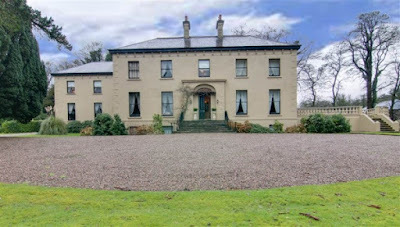 AMPERTAINE HOUSE, Upperlands, County Londonderry, is the most notable of a number of country houses in the vicinity built by various members of the Clark family. This family's linen mills gave rise to the nearby "linen village" of Upperlands, based in the courtyard of one of these houses. Ampertaine, a plain, late-Georgian house, was built some time after 1821 by Alexander clark. It comprises two storeys over a high basement; a five-bay front; shallow projecting porch, with a fanlighted doorway set in an arched recess. The roof is eaved, on a a bracket cornice. The front was prolonged by a two storey, three-bay wing, set back, added in 1915. At the other end there was a Victorian conservatory on a high plinth. Ampertaine has a modest parkland with mature shelter belts enclosing the house. A "small thatched cottage" known as Upperlands formerly occupied the site of the present house, subsequently known variously as Ampertaine, Amptertain or Amportaine. The house lawns merge into gardens, which had become neglected and overgrown until the 1990s, when clearance began to expose a late Victorian ornamental garden with ponds, rockeries and iron bowers to the east and south-east of the house. The walled kitchen garden, east of the house, can be viewed through decorative iron railings on top of the west wall. It is laid out in conventional manner with cross and perimeter paths and contains a summer house, sunken garden, rose garden, the site of a lean-to glasshouse range with stove and old apple trees. On the north-east front of the house lie the foundations of a high plinth that once supported a circular Victorian conservatory. The park has a gate lodge of ca 1870, which replaced two earlier lodges; it lies across the road from the main entrance. Mary; Anne Jane; Eliza; Isabella; Emily. Emily Constance Jane; Wilhelmina Maud Isabel. COLONEL HAROLD RICHARD CHARLEY CBE DL (1875-1956), of Seymour Hill, 1st Battalion, Royal Irish Rifles; fought in the Boer War and First World War, with the 2nd Battalion, Royal Irish Rifles, and was wounded and became a PoW. In 1916 he started workshops for interned British servicemen at Murren. He was Officer-in-Charge for Technical Instruction for servicemen interned in Switzerland in 1917; Commissioner of British Red Cross Society, Switzerland, 1918; commander of the 1st Royal Ulster Rifles, 1919-23. Appointed CBE, 1920; City Commandant, Ulster Special Constabulary, 1924-52; originator of the British Legion Car Park Attendants scheme (adopted throughout Great Britain); Honorary Colonel, 1938, Antrim Coast Regiment (Territorial Army). COLONEL WILLIAM ROBERT (Robin) HUNTER CHARLEY OBE, born in 1924, married Catherine Janet, daughter of William Sinclair Kingan, in 1960. HUNTLEY, Dunmurry, originally known as Huntley Lodge, was built ca 1830 by William Hunter (1777-1856), of Dunmurry House, on land leased by the Stewarts of Ballydrain from the Donegall Estate. His son William (1806-90) lived in Huntley for a time and brought up his family. In the mid 1850s, he moved with his family to the Isle of Man. The house was then left by his father William (1777-1856) to his widowed sister, Mrs Isabella Charley (1800-82). Isabella's husband, William Charley of Seymour Hill, had died in 1838 and she lived at Seymour Hill until her eldest son William was married in 1856. Isabella then moved to Huntley, where she was joined by her late husband's sisters Mary (1820-86) and Anne Jane Stevenson (1822-1904), whose husband had died in 1855, and Emily (1837-1917). The ladies at Huntley were talented artists, did embroidery and kept beautiful scrapbooks. They supported many charities and gave generously to local churches, schools and church halls. They founded the Charley Memorial School at Drumbeg in 1892 in memory of their brother William Charley (1826-90) of Seymour Hill; and also established the Stevenson Memorial School, Dunmurry. They built the church hall in Dunmurry on the condition that a service must be held there every Sunday afternoon. Huntley remained in the possession of the Charley family until 1932, when Edward Charley, of Seymour Hill, died. 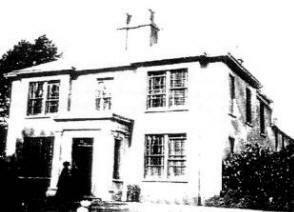 The house was sold to Mr George Bryson, who had been a tenant there since just after the 1st World War. Huntley now operates as bed & breakfast accommodation. GEORGE MacCARTNEY, who wedded, in 1522, Margaret, daughter of Godfrey MacCullogh, of Bank of Fleet, Kircudbright, Ayrshire. GEORGE MACARTNEY (1626-91), a Captain of Horse, born at Auchinleck, who removed to Ulster, 1649, and settled in County Antrim, where he acquired a large estate, and represented Belfast in parliament. In 1671 he served as High Sheriff of County Antrim, and in 1688 proclaimed WILLIAM & MARY at Belfast, for which he was soon after obliged to flee to England, and was attainted at JAMES II's parliament held at Dublin, 1689. Captain Macartney was restored on the settlement of the Kingdom. GEORGE MACARTNEY (1671-1757), MP for Belfast for 54 years, called to the Bar, 1700, High Sheriff of County Antrim, Deputy Governor and Colonel of a Regiment of Militia Dragoons, who married firstly, in 1700, Letitia, daughter and co-heir of Sir Charles Porter, LORD CHANCELLOR OF IRELAND; and secondly, Elizabeth Dobbin. Elizabeth, m Major John Blaquiere; mother of ELIZABETH. Martha Ellen; Elizabeth Jane; Anne Sophia. This gentleman, whose patronymic was HUME, assumed, by Royal Licence, 1814, the surname and arms of MACARTNEY under the will of his grand-uncle George, 1st Earl Macartney. Helen Henrietta; Mabel Constance; Frances Rose. GEORGE TRAVERS LUCY (1896-1943), of Lissanoure. George Travers Lucy Macartney was the last member of the Macartneys to live at Lissanoure Castle. He was said to be eccentric and a spendthrift. Mr Macartney purchased the Torr Head fishery and initiated several fruitless projects. He died on holiday in County Cork on the 11th July, 1943. Lissanoure estate was subsequently sold to the Mackie family, of Belfast, industrialists, but had already been requisitioned by the Ministry of Defence as a training base for British and American troops during the 2nd World War. There was also a German prisoner-of-war camp at Lissanoure, and the Mackies did not get full possession until the end of the war in 1945. 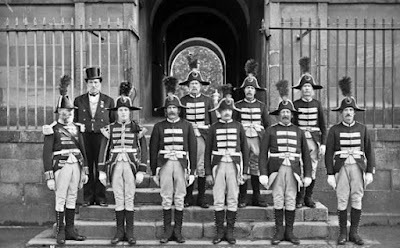 This family had been settled in Ireland from the period of the civil wars, during the reign of CHARLES I, when Edmund Hayes went over with Cromwell's party, and attained the rank of Colonel in his army; but whether he was English or Scots ancestry is uncertain. CHALLIS HAYES, son of Challis Hayes, of Bridgwater, Somerset, Vice-Consul at Lisbon, married Miss Deborah Holditch, of Totnes, Devon. SAMUEL HAYES (1737-1807), MP for Augher, 1783-90, married Mary, daughter of William Basil (previously Ball), of Wilton Park, Buckinghamshire, and Drumboe Castle. Mr Hayes was created a baronet in 1789, denominated of Drumboe Castle, County Donegal. 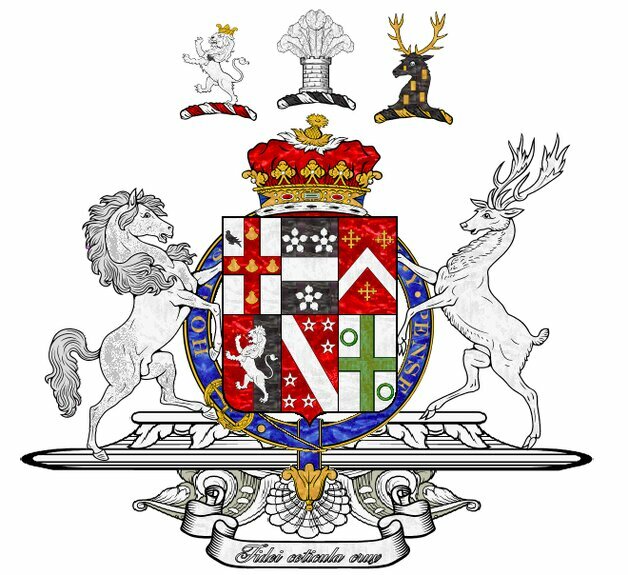 SIR EDMUND SAMUEL HAYES, 3rd Baronet (1806-60), of Drumboe Castle, MP for County Donegal, 1831-60, founding member of the Carlton Club, who wedded, in 1837, Emily, daughter of Hon Hercules Robert Pakenham, son of Edward, 2nd Lord Longford. 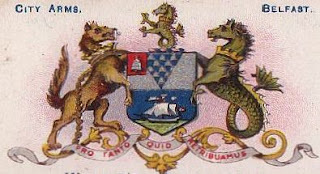 SIR SAMUEL HERCULES HAYES, 4th Baronet (1840-1901), of Drumboe Castle, High Sheriff of County Donegal, 1884-7, wedded, in 1878, Alice Anne, daughter of James, 4th Viscount Lifford and had issue, a daughter, Alice Emily Hayes. 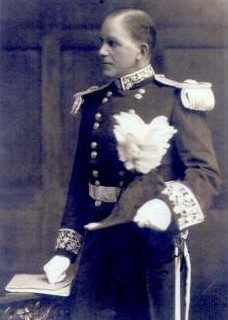 SIR EDMUND FRANCIS HAYES, 5th and last baronet (1850-1912), of Drumboe Castle, who inherited the family estate in 1901 on the death of his brother, Sir Samuel, 4th Baronet. He married Alice Isabella, daughter of Judge Wilkinson, of Sydney, Australia, in 1900. Sir Edmund died at Drumboe Castle. On his death the baronetcy became extinct. Lady Hayes died in 1943 from injuries sustained after stepping in front of a tramcar, in 1943, in Sydney. DRUMBOE CASTLE, near Stranorlar, County Donegal, was a Georgian house comprising a three-storey centre with a three-sided centre bow and pillared porch; and bow-ended wings. There was a Wyatt window on either side of the centre bow. In 1622, Robert Redington sold the estate at Ballybofey to Sir Ralph Bingley. Bingley erected the original Drumboe Castle, which had four large towers. Its location protected a ford across the river. After the death of Sir Ralph, his widow, Jane, and Robert Harrington took charge until 1641, when it was granted to Sir William Bazil, Attorney-General for Ireland. A descendent of Sir William Bazil was William Basil (formerly William Ball), who married Frances Dowdeswell ca 1736. Their daughter, Mary Basil, married Sir Samuel Hayes Bt and through this marriage it became the home of the Hayes Baronets, of Drumboe Castle, from 1789 until 1912. 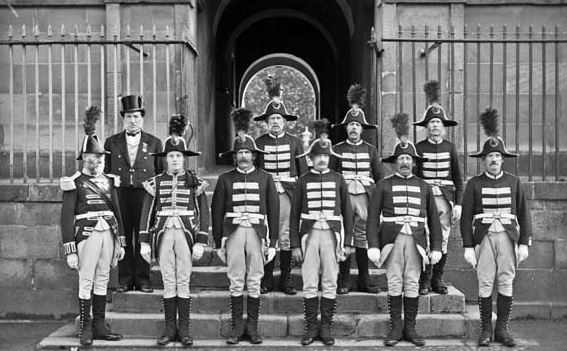 It became the General Headquarters for the forces of the Irish Free State in County Donegal during the Irish Civil War. It is infamous for being the location of the Drumboe massacre during the Irish Civil War. The house has been ruinous since 1945. In the reign of EDWARD III its members were styled "Hill, alias de la Montagne"; but in succeeding ages they were known by the name of HILL only. 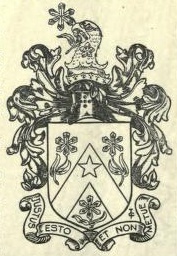 SIR MOYSES HILL, Knight, descended from the family of HILL, of Devon (two members of which were judges of England in the beginning of the 15th century, and one Lord Mayor of London, 1484), went over to Ulster, as a military officer, with the Earl of Essex, in 1573, to suppress O'Neill's rebellion. This Moyses was subsequently appointed governor of Olderfleet Castle, an important fortress at the period, as it protected Larne harbour from the Scots. His first land purchase in County Down came in 1607, when he bought the Castlereagh estates of the hapless Conn O'Neill, Earl of Tyrone. Thereafter Sir Moyses acquired the Kilwarlin estate - now Hillsborough - from the Magennises. PETER HILL; but we pass to his younger son, ARTHUR, who eventually inherited the estates, upon the demise of Peter's only son, Francis Hill, of Hill Hall, without male issue. ARTHUR HILL, of Hillsborough, was Colonel of a regiment in the service of CHARLES I, and he sat in parliament under the usurpation of CROMWELL, as well as after the Restoration, when he was sworn of the privy council. WILLIAM HILL, succeeded to the estates at the decease of his half-brother, Moyses, without male issue. This gentleman was of the privy council to CHARLES II, and JAMES II, and was MP for County Down. He married firstly, Eleanor, daughter of the Most Rev Dr Michael Boyle, Lord Archbishop of Armagh, LORD CHANCELLOR OF IRELAND, by whom he had an only son, MICHAEL. 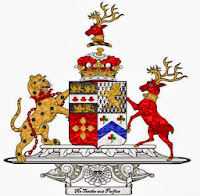 Mr Hill wedded secondly, Mary, eldest daughter of Sir Marcus Trevor, who was created Viscount Dungannon (1st creation) in 1662 for his signal gallantry in wounding OLIVER CROMWELL at Marston Moor, and had two other sons. MICHAEL HILL (1672-99), of Hillsborough, a member of the privy council, and of the parliaments of England and Ireland. Arthur, 1st Viscount Dungannon (2nd creation). TREVOR HILL (1693-1742), of Hillsborough, who was elevated to the peerage, in 1717, as Baron Hill, of Kilwarlin, and Viscount Hillsborough, of County Down. WILLS, 2nd Viscount (1718-93), who was created Viscount Kilwarlin and Earl of Hillsborough, in 1751, with remainder, in default of male issue, to his uncle Arthur Hill; and enrolled amongst the peers of Great Britain, in 1756, as Baron Harwich, in Essex. The 1st Earl was further advanced, in 1789, to the dignity of a marquessate, as MARQUESS OF DOWNSHIRE. Charlotte, m to 1st Earl Talbot. His lordship wedded secondly, Mary, 1st Baroness Stawell, and widow of the Rt Hon Henry Bilson-Legge, son of the 1st Earl of Dartmouth, by whom he had no issue. 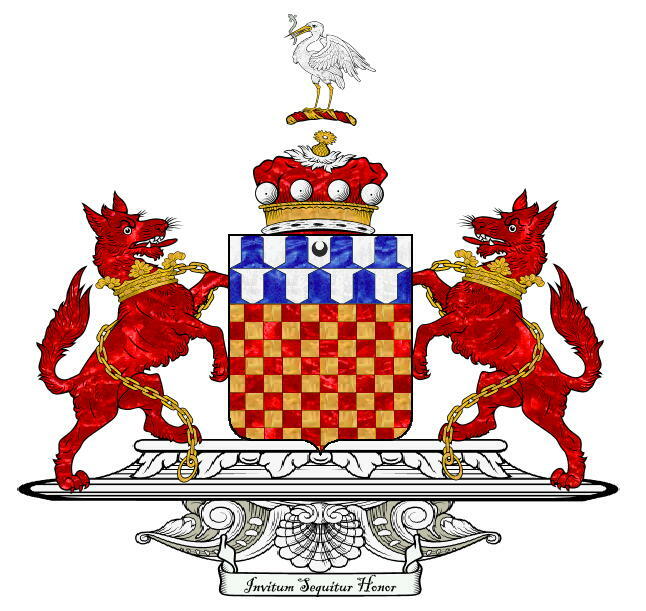 The 2nd Marquess died in 1801, and the Marchioness having subsequently succeeded to the estates of her uncle, Edwin, 2nd Baron Sandys, was created, in 1802, BARONESS SANDYS, with remainder to her second and younger sons successively. The heir apparent is the present holder's son Edmund Robin Arthur Hill, styled Earl of Hillsborough. In 1870, Lord Downshire owned 115,000 acres, mainly in County Down; and a further 5,000 acres at Easthampstead Park in Berkshire. Their principal seat was Hillsborough Castle; and they also had a marine residence, Murlough House, near Dundrum, also in County Down. Lord Downshire sold Hillsborough Castle to the Government in about 1921, I think; and Murlough remained with the family till the 1940s or 50s. Easthampstead Park was sold after the 2nd World War. Other seats included North Aston Hall, Oxfordshire; Timweston, Buckinghamshire; and Hill Park, Kent. Today the Downshires live at Clifton Castle, near Ripon in North Yorkshire. Downshire arms courtesy of European Heraldry. First published in July, 2009. SAMUEL COWDY, of Taughlumny, near Banbridge, County Down, was a sergeant in Cromwell's army, from whom he received a farm of 273 acres at Taughlumny. 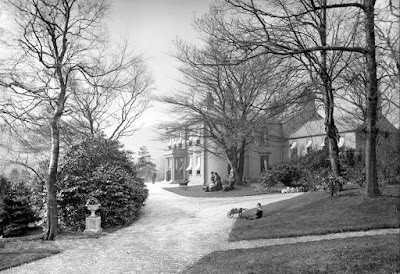 EDWARD COWDY JP DL (1873-1934), of Summer Island, County Armagh (below), who wedded, in 1903, Mary Jane, daughter of Robert McKean JP, of Rockwood, Benburb, County Tyrone. RALPH EDWARD COPE COWDY DL (1940-2013), High Sheriff of Armagh, 2007. SUMMER ISLAND, near Loughgall, County Armagh, was purchased from the Verner family by Edward Cowdy in 1908. 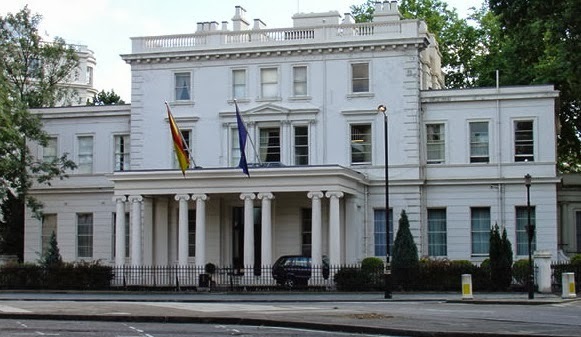 It is a Georgian villa of two storeys and five bays; fine fanlight above the main door, with columns and pilasters. The roof is hipped with dentils at the eaves. The main entrance to Summer Island boasts one of the most delightful pairs of gate lodges in the Province, which were built ca 1820. They are backed by mature lime trees which stand out in the landscape of this slightly raised strip of land in an otherwise flat area. Shelter belts protect the southern half of the parkland, at the centre of which is the late 18th century classical house. There is a modern ornamental garden at the house but the walled garden is not cultivated. Mr Ewart, Mayor of Belfast, 1859-60, MP for Belfast 1878-89, was created a baronet in 1887, denominated of Glenmachan House, County Down, and of Glenbank, Belfast. Charlotte Hope; Isabella Kelso; Mary Gundreda. Sir Ivan, Lieutenant, Royal Navy Volunteer Reserve Coastal Forces, was awarded the Distinguished Service Cross, 1945; chairman, William Ewart & Sons, 1968-73; Chairman, Ewart Northern Ltd, 1973-77. 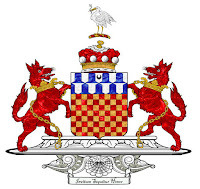 SIR WILLIAM MICHAEL EWART (b 1953), 7th and present Baronet, of Hillsborough, County Down. THE EWARTS originally lived at Annahilt, near Hillsborough, County Down. The 1st Baronet's father, William Ewart (1789-1873), moved to Glenbank at Ligoniel and became an alderman of Belfast. In 1716, Thomas Ewart was granted twenty acres for a lease of a farm in the townland of Carnreagh, Annahilt, near Hillsborough. Part of his agricultural activity involved the production of damask, which the then Linen Board encouraged. The lease was renewed to his son Thomas in 1746; the latter's son William was more ambitious and sometime around 1790 set up his own concern at Ballymacarrett, then a village, now a suburb of Belfast, though he co-operated with the Hillsborough concern. His business flourished, and he had agents outside Ulster. He took his son, also William, into business with him and as William Ewart & Son set up an office and warehouse in Rosemary Street, Belfast, in 1814. They were incorporated as William Ewart & Son in 1883. The Ewart head office was at what has become known as the Ewart Building, formerly Bedford Street Weaving Factory, at 17 Bedford Street, opposite the Ulster Hall. The tall, red-brick warehouses and weaving sheds at the rear have since been demolished. Ewart's bought the building in 1876. They also ran mills at Crumlin Road; Ligoniel; Ballysillan; and Matier Street, all in Belfast. During Victorian times, Ewart's was the largest manufacturer of linen in the world. The principal seat of the Ewart family was Glenmachan House (below), which was set in its own grounds off Old Holywood Road in east Belfast. 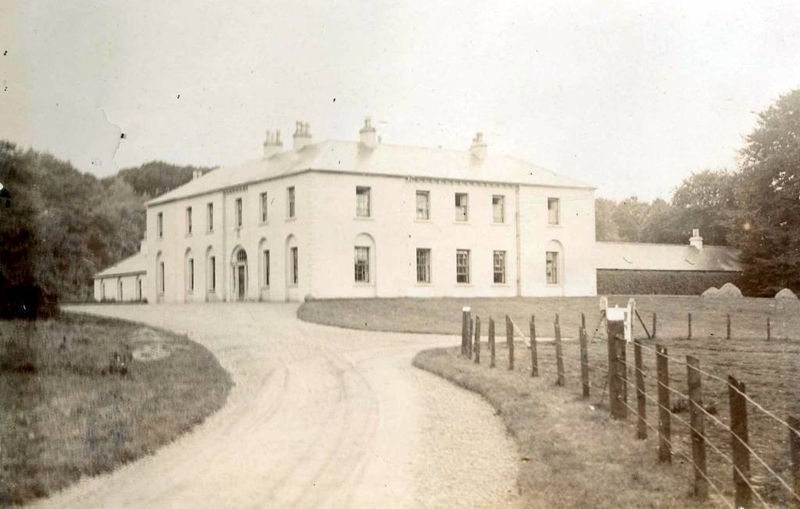 It is thought that the land at Glenmachan was sold by Sir Thomas McClure to the prominent Belfast architect of the time, Thomas Jackson, who proceeded to build Glenmachan House as his own residence; though sold it to Sir William Ewart some time thereafter. Glenmachan was a relatively large house with stabling and a conservatory. About 1894 a fire broke out in the stables. The hay loft was seriously damaged, according to a local newspaper. The grounds extended to 33 acres in 1876. 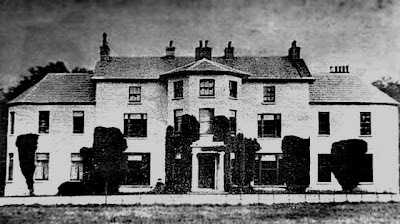 Glenmachan remained in ownership of the Ewart family till about 1976. Thereafter, it became neglected and derelict, the sweeping lawns reverting to fields. Despite some strong local opposition, Glenmachan House and grounds were finally sold to a property developer ca 1990, demolished and turned into a new housing development. Glenmachan House is not to be confused with Glenmachan Tower, further along the road and formerly the Shillingtons' residence. 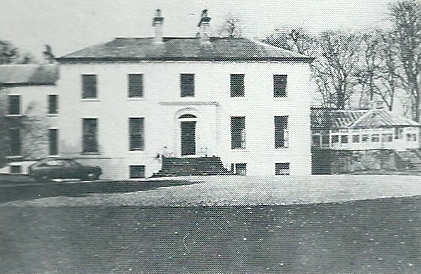 Glenbank House (ca 1875) used to be the Ewarts' family home. It was situated on Ligoniel Road in Belfast. Glenbank was purchased from Robert Thompson by Lavens Mathewson Ewart. Ca 1920 the house and grounds were presented to Belfast Corporation for use as a public park. All that now remains to remind us of its former existence are the gate pillars. The Henderson (Belfast Newsletter/UTV) and Ewart families are related through marriage, Primrose Henderson's mother being Gundreda Ewart. The Hendersons, whose residence was Norwood Tower (52 acres), would certainly have known the Ewarts, because the families all worshipped at St Mark's parish church. The famous author, C S Lewis, was a second cousin of the Ewarts and often visited Glenmachan. The 1st baronet contributed towards the building of St Mark's parish church, Dundela. The intrinsic interest of this humorous narrative of the holiday excursion of a knot of English officers in Ulster in the last days of ELIZABETH I's reign derives an extrinsic attraction from the fact that its author was a brother of the famous founder of the Bodleian Library. Sir Josias Bodley (c1550-1617) was the youngest of Sir Thomas Bodley's four brothers. In March, 1604, he was knighted by Mountjoy. After the pacification of Ireland he was appointed to superintend the Castles of Ireland. In 1609 Bodley was selected to survey the Ulster Plantation, and in recognition of this work received the appointment of director-general of the fortifications of Ireland, a post which he held until his death. Bodley, who died in 1617, was buried at Christ Church Cathedral, Dublin. SIR ARTHUR CHICHESTER, the founder of the fortunes and acquirer of the immense estates (though not the direct ancestor) of the Donegall family, is too well known in Irish history to need much notice here. as well as those of the western parts of Ulster under the command of Sir Henry Docwra (whose headquarters were at Derry, and under whose superintendence the walls and fortifications of that town were shortly afterwards erected) to drive Tyrone out of his fastnesses. without a road to penetrate or a guide to trust; besides having to ford a river which, if swollen by rain, would eventually cut off his retreat. It reminds us of some of the difficulties we read of as attendant on the late Caffre war. Sir Arthur Chichester was appointed Lord Deputy of Ireland, 1604-5, and held that office for the long period of ten years, during which time he was created a peer [1st Baron Chichester]. He was then appointed Lord High Treasurer, and held that office till his death in 1625. His monument is to be seen in Carrickfergus Church. He died without issue and was succeeded by his brother. *Glenconkeine - comprised parishes which included Desertmartin ... extended nearly from Dungannon to Dungiven. Dockwra says it was a wilderness of woods, ravines and mountains, extending 20 miles in length and 10 in breadth; and all the writers of that day agree that as a fastness it was almost impenetrable. Traditions still exist amongst the mountains of Londonderry and Tyrone of the immense forests that filled their valleys; and of their being inaccessible from the total absence of roads. First published in September, 2015. Chichester arms courtesy of European Heraldry.